A region that looks calm at first glance is seen as an active area of currents on closer inspection, using the mouse wheel to zoom in. It follows an interactive global wind map, also created by Mr Beccario (see GeoGarage blog). Studied together, they reveal just how unpredictable our planet’s weather system can be. If you’ve ever wanted to sail through the world’s powerful ocean currents, then take a look at this. Created by Tokyo-based Cameron Beccario, this interactive globe shows the ocean currents in real time as they swirl around continents. Users can drag the globe to their desired location and click on the spot they want to find out an ocean current in all its grandeur. Fascinatingly, the globe gives viewers an insight into the five major ocean gyres, the large systems of rotating ocean currents, particularly those involved with large wind movements. 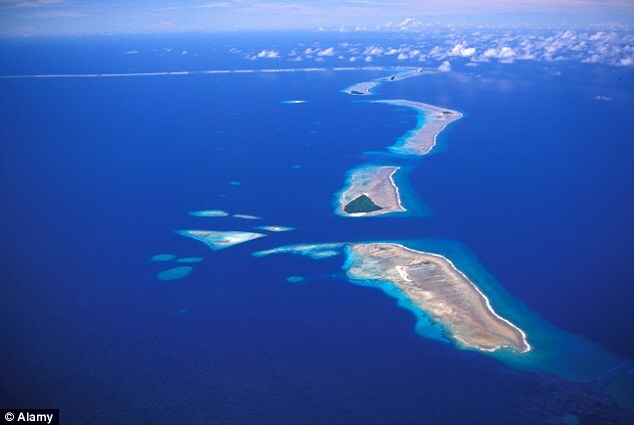 The five - located in the Indian Ocean and in the north and south of the Pacific and the Atlantic - are clearly visible and their affects can be traced throughout the world. Pictured here is the ocean current system close to the UK. 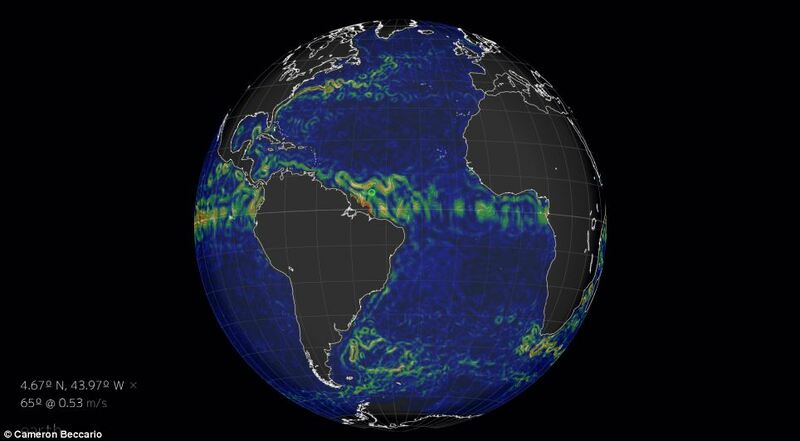 The map relies on data compiled by NOAA's Global Forecast System to update its global wind patterns every three hours, and OSCAR Earth and Space Research to update its ocean surface current patterns every five days. Details are thin on the ground on the sparsely-designed website, created by software engineer Mr Beccario, but it describes itself as a 'visualisation of global weather conditions forecast by supercomputers'. It follows an interactive global wind map, also created by Mr Beccario. Studied together, they reveal just how unpredictable our planet’s weather system can be. Ocean currents transport huge amounts of heat around the world, making them one of the most important driving forces of climate. Perhaps the most striking example is the Gulf Stream, which makes northwest Europe milder than other regions at the same latitude. 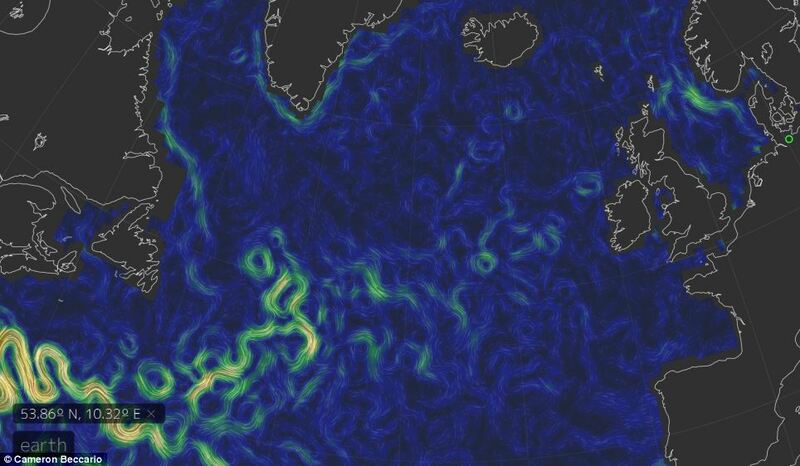 The ocean currents map follows an interactive global wind map (pictured), also created by Mr Beccario. The currents are generated from the forces acting upon the water like the Earth's rotation, the wind, the temperature and salinity differences and the gravitation of the moon. The colours in this map denote speed, with red the fastest at over 1 metre per second and blue showing a static state. The data visualization in this excerpt represents a high point in the Scientific Visualization Studio's work in recent years to show "flows" -- ocean currents, winds, the movement of glaciers. Using data from sophisticated NASA models, the studio's visualizers have figured out how to illustrate the velocities of these natural phenomena. Interactive version of the 2014 submarine cable map. providing an excellent representation of the infrastructure that makes global connectivity global. The latest edition depicts 285 cable systems that are currently active or due to enter service by 2015. Great news for connectivity connoisseurs: the analyst firm TeleGeography just published this year’s edition of its world map, featuring all the submarine cable systems that comprise the arteries of the internet. The map also shows the cables’ landing points, which is handy for those who take an interest in the current surveillance scandal. Why is British intelligence so good at tapping cables? The 2014 edition includes 263 cables that are lit (in service), and 22 that should be lit by the end of 2015, so 285 cable systems in total. Last year’s map showed 244 cables, and the year before that just 150, so the cable-laying boom of a few years back has definitely slowed down. Unfortunately this year’s edition lacks a neat feature of Telegeography’s 2012 and 2013 maps, which was a breakdown of how much of the cable systems’ capacity is actually being used. It also doesn’t have the 2013 edition’s Olde Worlde appeal. On the plus side, it does offer a good breakdown of cable faults over recent years, cable-laying ships and maintenance zones, if that’s your thing. One cable system that’s not on the map, probably because it will only go live in 2016, is the Asia Africa Europe-1 (AAE-1) cable that was detailed on Tuesday. AAE-1 will run from South-East Asia to Africa and Europe via the Middle East, and yesterday the backing consortium announced membership including the likes of China Unicom, PCCW, Etisalat and Ooredoo. The map depicts routes of 263 in-service and 22 planned undersea cables. Each country is colored according to how many international submarine cable system links are connected there. Capital cities and the location and direction of 44 cable vessels (as of December 6, 2013) are also provided. The map provides detailed information about cable landing stations in key regions including Hawaii,Southern Florida, New York, New Jersey, Cornwall, Singapore, Hong Kong, Tokyo, and Sydney. An inset map presents geographically accurate submarine cable paths, the locations of seven cable maintenance agreement zones, and subsea topographical features. The map includes a diagram highlighting the various parts of a submarine cable system, including a submarine cable cross section. The map provides examples of trans-Atlantic and trans-Pacific cable route seabed profiles. During a routine test of an underwater robot, NSF scientists from University of Nebraska-Lincoln made a startling discovery...an entirely new species of sea anemone living inside the ice. National Science Foundation (NSF)-funded researchers from the University of Nebraska-Lincoln, while using a camera-equipped robot to survey the area under Antarctica's Ross Ice Shelf, unexpectedly discovered a new species of small sea anemones that were burrowed into the ice, their tentacles protruding into frigid water like flowers from a ceiling. "The pictures blew my mind, it was really an amazing find," said Marymegan Daly, a specialist in sea anemones at Ohio State University, who studied the specimens retrieved by scientists and engineers with the NSF-funded Antarctic Geological Drilling (ANDRILL) Program's Coulman High project. The team made the astonishing discovery of thousands upon thousands of the small anemones. The new species, discovered in late December 2010, was publicly identified for the first time in an article published last month in PLOS ONE, an open-access, peer-reviewed journal published by the Public Library of Science. Known localities of Edwardsiella andrillae, n. sp. The site labeled A is at 77° 31.6’ S 171° 20.1’ E ; this corresponds to “Site 3” for the 2010-2011 SCINI dive series. The site labeled B is at 77° 28.03’ S 171° 36.28’ E ; this corresponds to “Site 4 (CH-1)” for the for the 2010-2011 SCINI dive series (Rack et al., 2012). Though other sea anemones have been found in Antarctica, the newly discovered species is the first reported to live in ice. They also live upside down, hanging from the ice, compared to other sea anemones that live on or in the seafloor. The white anemones have been named Edwardsiella andrillae, in honor of the ANDRILL Program. "It is an absolutely astonishing discovery--and just how the sea anemones create and maintain burrows in the bottom of the ice shelf, while that surface is actively melting, remains an intriguing mystery," he said. "This goes to show how much more we have to learn about the Antarctic and how life there has adapted." NSF is responsible for managing all scientific research and logistics of the U. S. Antarctic Program on the Antarctic continent and in the Southern ocean. The discovery was "total serendipity," said Frank Rack, executive director of the ANDRILL Science Management Office at the University of Nebraska-Lincoln. "When we looked up at the bottom of the ice shelf, there they were." Scientists had lowered the robot--a 4.5-foot cylinder equipped with two cameras, a side-mounted lateral camera and a forward-looking camera with a fish-eye lens--into a hole bored through the 270-meter-thick shelf of ice that extends over 600 miles northward from the grounding zone of the West Antarctic Ice Sheet into the Ross Sea. Their research mission, funded by NSF with support from the New Zealand Foundation for Research, was to learn more about the ocean currents beneath the ice shelf to provide environmental data for modeling the behavior of the ANDRILL drill string (a length of pipe extending through the water column and into the sea floor through which drilling fluids are circulated and core samples are retrieved), Rack said. They didn't expect to discover any organisms living in the ice, and surely not an entirely new species. Rack, who is U.S. principal investigator for the environmental surveys that were conducted as part of the international ANDRILL Coulman High project, had left the site via helicopter just prior to the discovery. He was listening by radio when he heard the report from the robot deployment team, composed of engineers Bob Zook, Paul Mahecek and Dustin Carroll, who began shouting as they saw the anemones, which appeared to glow in the camera's light. "People were literally jumping up and down with excitement," Rack said. "They had found a whole new ecosystem that no one had ever seen before." "What started out as an engineering test of the remotely operated vehicle during its first deployment through a thick ice shelf turned into a significant and exciting biological discovery," he said. External anatomy and habitus of Edwardsiella andrillae n. sp. A. Close up of specimens in situ. Image captured by SCINI. B. “Field” of Edwardsiella andrillae n. sp. in situ. Red dots are 10 cm apart. In addition to the anemones, the scientists saw fish who routinely swam upside down, the ice shelf serving as the floor of their submarine world, as well as polychaete worms, amphipods and a bizarre little creature they dubbed "the eggroll", a four-inch-long, one-inch-diameter, neutrally-buoyant cylinder, that seemed to swim using appendages at both ends of its body, which was observed bumping along the field of sea anemones under the ice and hanging on to them at times. The anemones themselves measured less than an inch long in their contracted state--though they get three to four times longer in their relaxed state, Daly said. Each features 20 to 24 tentacles, an inner ring of eight longer tentacles and an outer ring of 12 to 16 tentacles. After using hot water to stun the creatures, the team used an improvised suction device to retrieve the animals from their burrows. They were then transported to McMurdo Station for preservation and further study. Because the team wasn't hunting for biological discoveries, they were not equipped with the proper supplies to preserve the specimens for DNA/RNA analyses, Rack said. The specimens were placed in ethanol at the drilling site and some were later preserved in formalin at McMurdo Station. Cnidae of Edwardsiella andrillae n. sp. Scale at bottom, in µm, applies to all images. See Table 1 for size ranges for each capsule type in each tissue. C. Spirocyst. Although this capsule is smaller and has a thinner tubule than the spirocyst in Figure 4A, spirocysts show continuous variation in capsule size and robustness. F. Small microbasic mastigophore. The small size of these cnidae precludes distinguishing them as b- or p- mastigophores. Many mysteries remain about the creatures, the scientists report. Though some sea anemones burrow into sand by using their tentacles or by expanding and deflating the base of their body, those strategies don't seem feasible for hard ice. It is also unclear how they survive without freezing and how they reproduce. There is no evidence of what they eat, although they likely feed on plankton in the water flowing beneath the ice shelf, Daly said. Rack said a proposal is being prepared for further study of this unusual environment, using a robot capable of exploring deeper in the ocean and further from the access hole through the ice. NASA is helping to finance the development of the new underwater robot because the Antarctic discoveries have implications for the possibility of life that may exist on Europa, the ice-covered moon of Jupiter. He said researchers hope to return to Antarctica as early as 2015 to continue studying the sea anemones and other organisms beneath the ice shelf. Maps can be beautiful and good ones can be great investments. But what collectors often find most entrancing about maps are how they provide portals into history. The rise and fall of cities, the charting of war and adventure, the promise of riches through trade ... history continues to be rewritten according to scholars' reinterpretations of ancient cartography. John Selden's 17th-century map of China made a huge splash recently as the stimulus for two new books analyzing London's rise as an economic hub (the city's success is inextricably linked to trade with China, as the Selden map illustrates). According to some experts, the current unprecedented volume of global travel is also contributing to a burgeoning interest in map collecting. "I believe that as people travel more, migrate more and speak more languages, and as business becomes more globalized, the appeal of two types of attachment to the idea of 'place' increases," says Daniel Crouch, a London based specialist of antique maps and atlases. "One, as an identification with, or memory of, a place or homeland left behind, and the other as a statement of a new 'home' or adopted country, or fondness for a land visited." Crouch reveals some fascinating map facts gathered from a lifetime of collecting and selling antique maps, and shares favorites from his most recent exhibition in Hong Kong featuring maps of China. Founded in 1795 by King George III, the British Hydrographic Office produced sea charts and were allowed to sell them to the public. Even the wealthiest collectors of old master or impressionist paintings, Chinese ceramics or modern art can never hope to have collections of a quality to match the likes of the Louvre, the British Museum or the Met. However, that's not true of maps. The savvy collector can still buy maps or atlases as good as, and sometimes better than, those found in the world's major libraries and museums. 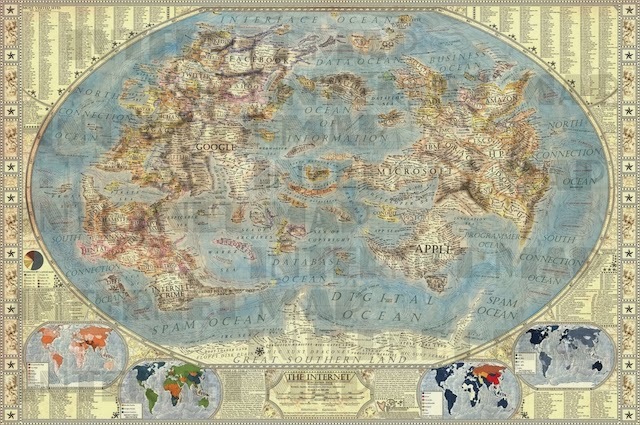 "We have several items in our gallery that are at least as good, if not better, than the equivalent examples in, say, the Bibliotheque Nationale, the British Library or Library of Congress," says Crouch, whose gallery keeps approximately 250 maps and 50 atlases in stock at any one time. Antique maps featuring the world's biggest developing countries have seen a recent spike in prices. According to Crouch this heightened interest can be linked to the recently increased inbound and outbound travel from these countries. "Maps of B.R.I.C. nations (Brazil, Russia, India and China) have seen the fastest growing markets (and prices) in recent years," says Crouch. "I have also noticed an increased interest in 'thematic' and 19th and even early 20th century mapping," he says. While the earliest maps were rudimentary diagrams drawn in caves in pre-historic times, the first proper manuscript maps appeared in the 12th century. The map of the Holy Land printed in the "Rudimentum Novitiorum," an encyclopedia of world history published in 1475, is considered the first modern printed map. A sample of the Rudimentum Novitiorum was sold for £500,000 ($829,000) in 2013. Ever been to the town of Agloe in New York State? While these towns are clearly marked on a number of antique maps of the United States, they don't actually exist. "Paper towns" were fake places added to maps by early mapmakers in order to dupe forgers into copying them, thereby exposing themselves to charges of copyright infringement. "The best collection in the world, in my opinion, is that of the Bibliotheque Nationale de France in Paris, followed by the Library of Congress in the United States and the British Library," says Crouch. "Many of what we now regard as the major institutional collections of cartography were actually put together by individuals in the 17th and 18th centuries. In the United Kingdom, the best collection of such material was made by King George III." The latter collection is known as the "K.Top," and can be found in the British Library. The U.S. Library of Congress paid a record $10 million for German cartographer Martin Waldseemüller's Universalis Cosmographia, a wall map of the world printed in 1507. It's the only surviving copy of the map, which was the first to use the name "America." 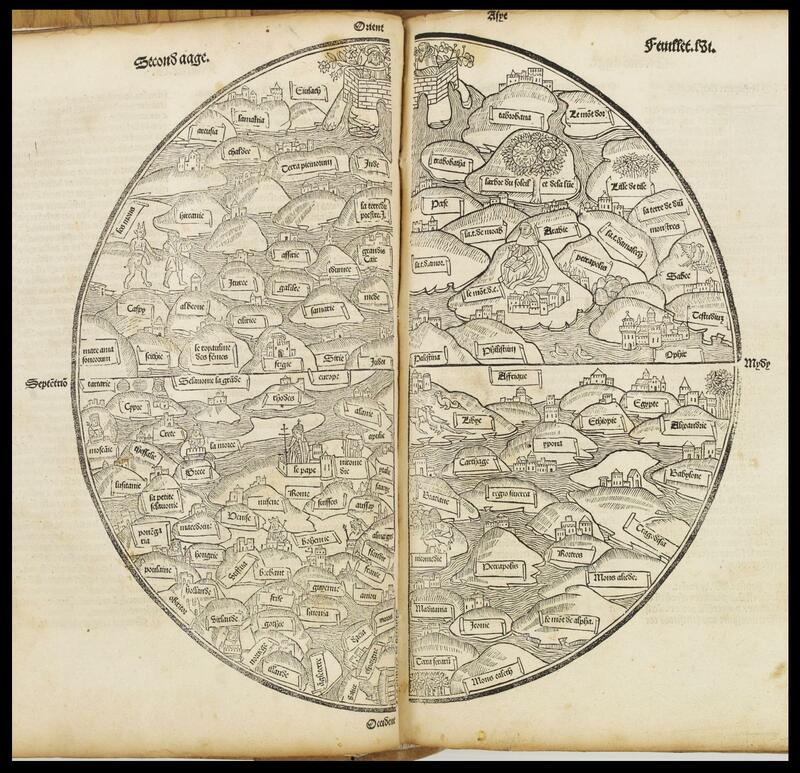 In 2007, Crouch brokered the sale of the most expensive atlas ever sold -- the 1477 Bologna Ptolemy, the first printed atlas -- for £1.9 million ($3.12 million). The annual European Fine Art and Antiques Fair in Masstricht, Netherlands is often considered the world's best place to shop for antique maps, classic and modern art and jewelry. More than 70,000 people visited the TEFAF Maastricht in March 14-23 to browse the 260 booths from 20 countries. "It's simply the biggest and best fine art fair in the world," says Crouch. But not everyone believes Alvarenga's tale, in part because he was not nearly as emaciated as others who have been lost at sea. "It does sound like an incredible story and I'm not sure if I believe his story," said Gee Bing, the acting secretary of foreign affairs for the Marshall Islands, told the AFP. This is the first picture of the 'Miracle Man of the Pacific' - the fisherman who survived on turtle blood, raw fish and seagull flesh for more than a year as he drifted helplessly across the world's largest ocean. When asked about his ordeal he simply replied: 'I cannot remember much about my journey. It had stretched out endlessly on all sides as Jose and his teenage fellow shark fisherman endured the most soul-destroying of conditions after their boat was left at the sole mercy of the currents when their engine broke down on December 21, 2012. Despite their attempts to attract other vessels, they continued to drift further out to sea. He watched his teenage fishing companion, aged between 15 and 18, slowly die under the relentless sun. Jose continued his own struggle for survival that was to endure for week after week, month after tortuous month, as he was forced to drink his own urine and pick ravenously at the raw flesh of seagulls. And while he believed that his faith had helped carry him through the 14 months he was adrift, it was also his determination to stay alive - grabbing turtles to drink their blood when there was no rain water, swallowing down his own urine, snatching seagulls to eat their flesh and hooking fish and eating them raw - that ensured his tenuous hold on life. 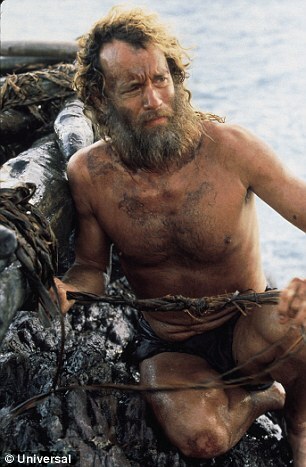 'I thank God that I am here,' he told MailOnline after his 24ft boat had drifted helplessly across 8,000 miles of treacherous seas, remarkably staying upright in storms, sitting idly in calm conditions, as the sole survivor thought about his family on a far-away continent. 'I'm alive, it is so good,' he said from his hospital bed after being brought to the Marshall Islands capital, Majuro. Of his ill-fated companion, all he would say is 'I'm sad for him'. Jose said he desperately wanted to phone his family - his wife and his 10-year-old daughter - in El Salvador but he cannot remember the name of the village or a phone number. 'I have forgotten many things,' he told MailOnline. Jose has even forgotten exactly how old he is. He 'believes' he is about 36 to 38, even though his ordeal has made him appear much older. Nor could the village people of Ebon atoll, which he had luckily struck, believe it when they saw the tussel-haired man with a thick beard, standing on a beach in tattered shorts, which had been decayed by sea-salt. They stared in astonishment at the stranger, whose skin was burned dry by the sun and the sea spray - but typical of their generosity they put him into one of their own small boats and carried him to their main village where they clothed and fed him and gave him fresh water. A Norwegan anthropology student, Ola Fieldstad, who was in the area managed to learn a little of his extraordinary story through sign language and a series of drawings. 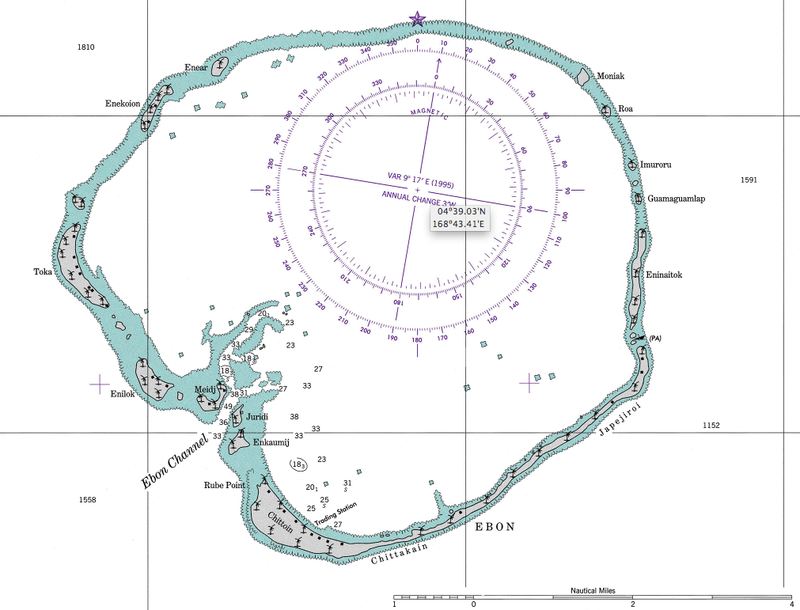 Then the local Mayor put a call through on the atoll's only phone to alert the authorities in Majuro about the castaway. 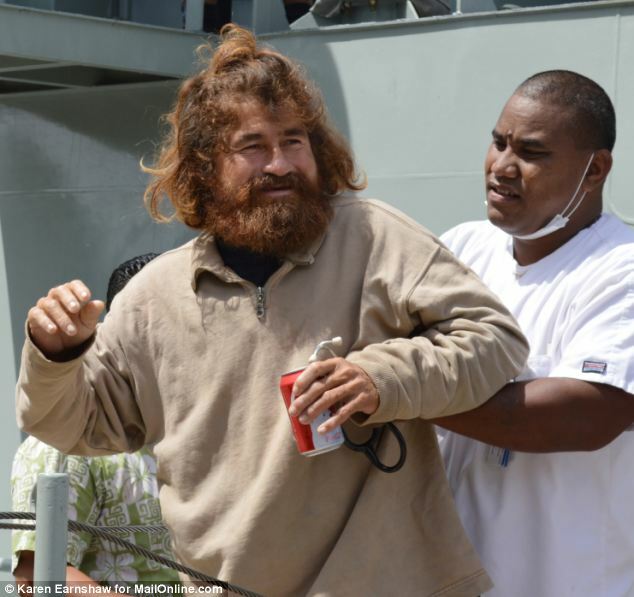 Astonishingly, the man who was in the care of the village for several days before he was brought to Majuro today, bore a striking resemblance to Tom Hanks' character in the movie Castaway, with his brown beard and tangled hair. Elements of Jose's story raced around the world...he had been at sea, said first reports, for 16 months; his companion had died after four months; he was completely emaciated. But as MailOnline established through his first words in the island capital and also witnessed he appeared in much better health than expected from such an ordeal. Jose doesn't appear emaciated from months of starvation. Doctors said, however, that his body was bloated from the conditions he had suffered. His blood pressure was low and he walked cautiously, but it was more his mental condition than his physical appearance that medics on the main island suggested would be his greatest challenge in coming days. He is expected to suffer the ongoing effects of prolonged exposure, fear of death, starvation and lack of water. Watching his teenage companion die would have added to his ordeal - and that was before the real terror began as he drifted for more than a year across the ocean. He would, said doctors, need complete rest while authorities in El Salvador, where his family live, make arrangements for him to be flown home to his wife and daughter. It is not known that when he described his daughter as aged 10 whether he was referring to her when he had set off on his ill-fated fishing expediton. 'I thought about them all the time,' he told MailOnline. As evidence of his gratitude, when he was asked by interpreter Magui Vaca if he had prayed all the time, he put his hands together in an attitude of prayer. It is perhaps not so surprising that Jose says he cannot remember the fine details of his ordeal when all he saw was the shape of his boat and the vast ocean on all sides. But a long rest in coming days, said doctors, would help him to recall more of his extraordinary survival. Doctors said the fact that he was still alive after such a long period at sea, snatching what liquid and solid foods he could, was testament to his original good physical condition. A human can live for about three weeks without food but only three to five days without liquids. Turtle blood is rich in iron and proteins, providing the same sort of nutrition found in steak and eggs, but it is still a poor substitute for rainwater. He might also have consumed the turtles' eyes, for they are filled with fluid. Jose's constitution undoubtedly also ensured his survival. A local Marshallese woman said that from her experience of other people who had died in remote locations it was because they had not been able to consume raw food - they kept vomiting it up - and this might have been why the fisherman had died. It's not inconceivable that this is the horrid death Jose's young companion was doomed to. A 24ft boat provides little room for exercise, even if a dehydrated and starving man has the strength to do any, so when he finally stumbled ashore he found it difficult to stand, complaining of pain in his knees. In a crackly radio conversation with MailOnline on Saturday, he revealed that there was just one thing on his mind now. Then, revealing that he had not lost his sense of humour, he added: 'If someone gets me home, I'm sure my boss will pay' - a reference to his employers, the Camoronera Dela Costa fishing company, in Tapachula, on the Guatemala border. Other castaways have died after much shorter times in open waters, among them two Panamanian fishermen who, in 2012, succumbed to heat stroke and dehydration after 28 days. 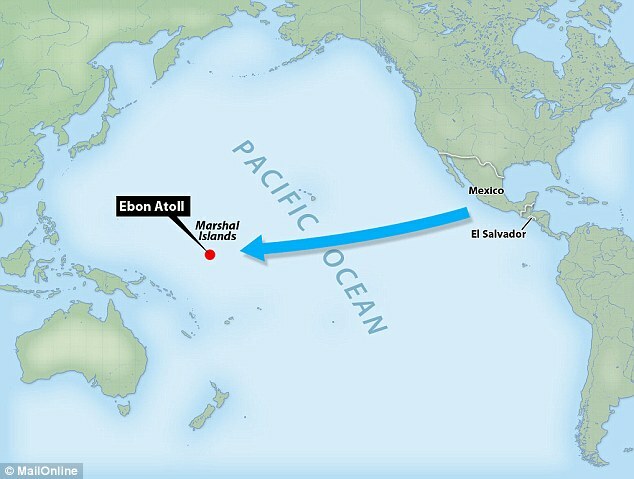 Back in 2006, three Mexicans, also adrift near the Marshall Islands, survived on fish, birds and rainwater for nine months, saying later that their mental health was sustained by a copy of the Bible.